Seth Standley of Fairbanks goes up for a layup with a Mechanicsburg defender in his face. Standley added two points off the bench to help the Panthers take a 73-41 win over the Indians. The Panthers of Fairbanks came out of the tip with a fast and furious basketball style that the Mechanicsburg Indians just could not handle. As a result, FHS won its Homecoming game, 73-41. Panthers head coach Justin George said the difference between Fairbanks’ first go- around against the Indians two months ago and Friday’s contest was night and day. “From the last time we played, we didn’t play very well, we didn’t shoot very well and we only made one three in that game,” he said. “Tonight, we were going on all cylinders. All cylinders started firing right away as the two teams tried to figure each other out in the opening three minutes. Jacob Nicol used his jets and moves to go coast-to-coast to score the opening basket for the Panthers. The Indians responded quickly with a bucket of their own, but that would be all the Panthers would give them in the first eight minutes. FHS took a 13-2 lead at the end of the stanza. The Panthers switched from a defensive-minded team to one focusing on pure offense in the second quarter. Stellar shooting from the starting five of Nicol, Mason Smith, Cross Hackathorne, Tyler Beem and Braylon Green pushed the Panthers along on the scoreboard. Hackathorne burned the net with a three-point goal, while both Smith and Green found six points each in the paint. Fairbanks used those offensive outputs to take a 33-11 margin at the turn. It was Beem’s turn to get hot after the break as he racked up eight points. The Panther bench was able to let some of the starting five take a breather. 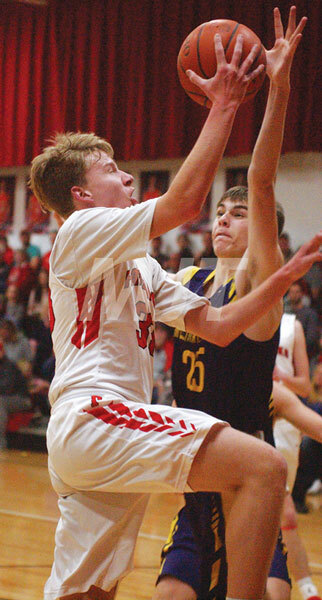 Wyatt Miller added a trey to FHS’ climbing score, while Seth Standley found a seam to the rim for two. George was happy with his bench’s support, as it tallied 15 points. “They played awesome,” he said. “They hit some big shots when they needed to and they supported us well. With solid play from all of the Panthers, Fairbanks took a commanding 54-21 lead into the final stanza. Fairbanks’ bench added additional minutes on the floor in the fourth quarter. Miller put up two points, while Owen Herbst tallied six as the Panthers cruised to their 17th win of the season and maintained a perfect 15-0 record in the Ohio Heritage Conference. With only one OHC game left on the Panther’s schedule, Northeastern on Friday, George is looking to close out league play with a perfect record. “We are trying to get to that perfect league record with only one league game left,” he said. Prior to that, FHS will travel to North Union on Tuesday. The Panthers are also hungry for the tournament season to start and will figure out who, when and where they will be playing as the tournament draw is scheduled for Sunday. Nicol 6-1-13, Beem 4-5-13, Hackathorne 5-0-12, Green 5-1-11, Smith 4-0-9, Herbst 3-0-6, Miller 2-0-5, Calder 1-0-2, Standley 1-0-2. Totals 31-7-73. Three-point goals: Hackathorne 2, Smith 1, Miller 1. Mascadel 5-7-17, Edwards 3-3-10, Taylor 0-5-5, Hurst 2-0-4, Smith 1-1-3, DeLong 1-0-2. Totals 12-16-41.